We use servo motors with a controller to automate mechanical movements. For starters, you’ll need a servo motor and a controller. There are two types of servo motors: one rotates 180 degrees reciprocating movement and the other one rotates continuously. Many references explain servo motors; so here we list several links that explain the basics. Besides the rotation type (180° or continuous), you will need to choose the motor size (standard or micro). A standard motor body is approximately 40x20mm (1.5”x0.8’’), and the micro size is 30x15mm (1.2”x0.6”). It doesn’t need to fit very accurately, as we’re using duct tape to attach the motor body to the part. In the map, as long as a product includes PWM pins (which is applied to all products), you can use it to drive a servo motor and program it. If you’re not interested in investigating further functions that each advanced product provides, the Arduino Uno (or Sparkfun Redboard) is a good place to start. For those using a continuous servo, remember that the command that sets the angle of a 180° servo motor (e.g.,ServoName.write(60)) instead sets the speed of a continuous servo. So, given a range of values from 0 to 180, a value near 90 stops the continuous servo motor, a value of 0 sets full-speed in one direction (“reverse”) and 180 sets the servo to full-speed in the other direction (“forward”). You’ll need to use a USB cable to connect the controller to your laptop where you might have downloaded and installed the Arduino software from here to program your controller. You also need to use three “jumper” wires to connect the power, ground and signal of your servo motor to your controller. Jumper wires need male connectors on both ends because both the arduino controller and servo motors have female “headers”. 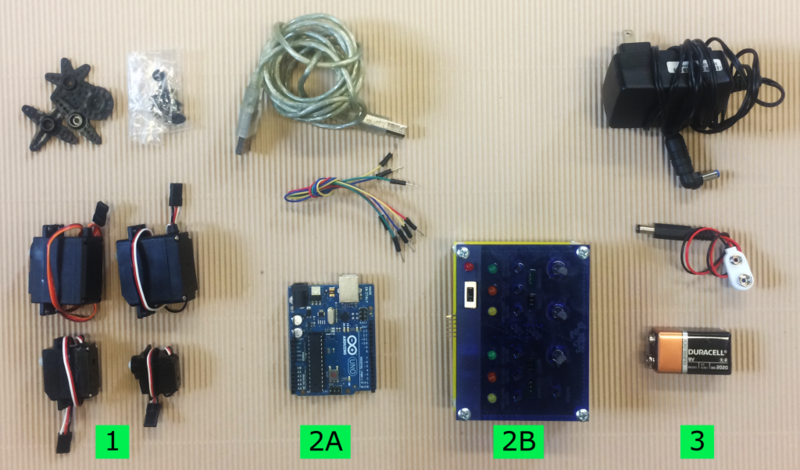 To facilitate the prototyping process focused on our purpose of using servo motors, we developed our own controller that doesn’t require programming. Using our LocoTap board, we can just plug in servo motors and rotate the knob or press buttons to control it. If you want to know more about LocoTap board, you can contact us. If you want to power your controller simply by a usb cable through a laptop, you don’t need an extra power supply. But if you don’t want to carry your laptop while making and displaying, you can use either a wall adapter or batteries with a battery holder.